Yeghegnadzor (Armenie: Եղեգնաձոր; aunciently, Yeghegik, till 1935, Keshishkend, frae 1935–1957, Mikoyan) is the caipital of the Armenie province o Vayots Dzor. The name o the ceety means "the valley o canes" in the Armenie leid. Durin Joseph Stalin's time, the ceety wis renamit efter Soviet politeecian Anastas Mikoyan. The toun is locatit 123 km sooth o the caipital Yerevan, on a sma river cried "Serkoghunk" (Armenie: Սրկողունք), at a hicht o 1194 meters abuin sea level. 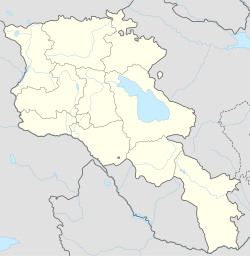 Yeghegnadzor is ane o the auncient settlements o the historic province o Syunik athin Greater Armenie (Armenia Mayor). It wis mentioned in history syne the 5t century. The ruins o a medieval fortress coud be foond near the ceety. The main economical activities in the ceety are based on construction sector an industrie. The maist important industrial firm o the ceety is the wine factory. There are mony firms as well for electro-mechanical tuils production. Lichter productions o canned fuids, textile an jewellery are foond in the toun an aw. In the suburbs o Yeghegnadzor, agriculture remains the main activity o the population. The toun haes fower public education schuils, three kindergartens, ane intermediate college, ane muisic an airt schuil an ane sport schuil. The geological museum o the toun wis opened in 2002. Yeghegnadzor is hame tae Arpa Yeghegnadzor fitbaa club which is currently inactive. Proshaberd fortress (Boloraberd fortress) o the 13t century, locatit few kilometers tae the north-east o Yeghegnadzor, near the veelage o Gladzor. The historical "University o Gladzor" o the 13t century, locatit in the veelage o Gladzor juist ootside Yeghegnadzor. Noravank Monastery o the 13t century, locatit few kilometers awa frae Yeghegnadzor, tae the soothwast o the toun. Spitakavor monastery o the Holy Mither o God built in 1321, locatit juist tae the north o Yeghegnadzor near Proshaberd fortress. Brady Kiesling, Rediscovering Armenia, p. 125; oreeginal airchived at Archive.org, an current version online on Armeniapedia.org. This page wis last eeditit on 10 Mairch 2018, at 23:36.